"Allied Forces"! "Rock & Roll Machine"! "Magic Power"! If you're fan of classic rock, you should know these songs by legendary Canadian rock band TRIUMPH by heart. Former TRIUMPH guitarist Rik Emmett signed with Mascot Label Group a few months ago, and it's time to reveal his new band and his new album. 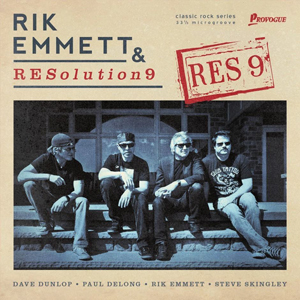 The members of RESOLUTION9 are from Rik’s touring quartet: Dave Dunlop on guitar, Steve Skingley on bass, and Paul DeLong on drums, with Dave and Steve co-producing the project. RES 9 features contributions from RUSH guitarist Alex Lifeson, DREAM THEATER vocalist James LaBrie, and Rik Emmett’s onetime TRIUMPH bandmates, bassist Mike Levine and drummer Gil Moore. Emmett’s ultimate goal for RES 9 is to connect with as many people as possible. “The context of this entire album for me was, ‘Wow, somebody tossed me a lifeline,’” he concludes. “I still want to make positive music and offer people something that’s motivating and inspiring — and I want to do it for myself too. I needmusic, and music can provide that lifeline for me.” Mission accomplished: “I’ve got a thirst for life,” as Emmett sings on “Human Race”. And you’ll find that thirst being quenched quite handily in the very heartbeats that percolate within all 11 tracks of RES 9. Drink up. RES 9 is available to pre-order on CD, black and red vinyl. The red vinyl is limited to only 300 copies worldwide, and available exclusively on the MLG webstore. These will sell out quickly, so act fast!